Recession and divorce: How the recovery will cause a boom in failed marriages, and why it’s good news. The coming boom in failed marriages and why it’s exactly what the economy needs. Money troubles are a huge strain on marriage, so you’d expect that divorce would surge after a massive recession and years-long period of weak growth. Yes, as far as we can tell, the national divorce rate has been falling throughout the Great Recession. There are lags in the federal government’s data, but the feds say the United States fell from 3.6 divorces per 1,000 Americans in 2007 to 3.5 divorces per 1,000 in 2008 to 3.4 divorces per 1,000 Americans in 2009. What’s more, there’s reason to believe that this is no coincidence. The bad economy is actually keeping people’s marriages together—divorce is expensive. 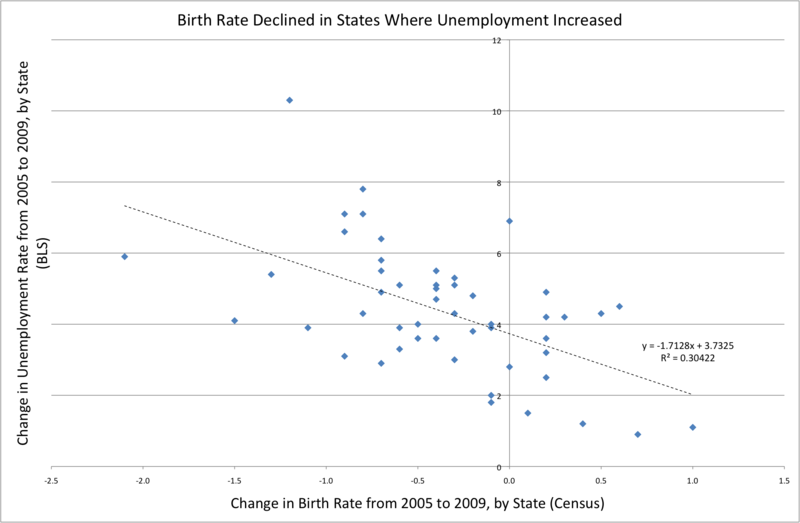 Mike Konczal, a fellow at the Roosevelt Institute, ran the numbers on a state-by-state basis and found that if you compare 2005 to 2009, states with a higher increase in unemployment saw larger drops in divorce rates. There’s at least some evidence that the mild economic recovery of 2011 has led to a divorce rebound, and if the unemployment rate continues to fall we can expect that trend to continue. Indeed, we should probably be expecting a temporary spike in divorce as several years of pent-up marital angst is unleashed in a single burst. Of course we should also see happier results. Young people will be excited to move out of their parents’ houses, where they have been forced to stay during the slump. It also seems likely that recovery will lead more people to have babies and start families. These data also tell us something about the way social conservatives misread the relationship between family life and prosperity. It’s become commonplace in conservative rhetoric and writing to note that single life, especially for parents, is strongly associated with poverty and bad economic outcomes. This was the rationale for the Bush administration’s marriage promotion initiatives, it’s a frequent theme in David Brooks columns, and it’s a centerpiece of Charles Murray’s new book. What’s more, it’s true. Living with another adult is, clearly, more economically efficient than living alone. That’s why young professionals in an expensive city like Washington, D.C., tend to share houses with roommates. It’s why young people move back home with their parents when they lose their jobs. And it’s one of the reasons why the divorce rate falls during a recession. But in all of these specific contexts we understand that there’s more than mere economics at stake. After all, just because you can move out of your parents’ house doesn’t mean that you have to. Relatively few empty nesters react to kids leaving home by immediately downsizing to a smaller abode. The bedroom is still sitting there, as is the laundry machine and the refrigerator. Even if you have a job, it would be more efficient to stay home and reap the household economies of scale that come with shared utilities, bulk purchase of groceries, etc. In practice people don’t do this, not because they’re dumb but because adults don’t want to live with their parents. It’s unpleasant, and one of the main reasons to want to get a job and have some money in your pocket is that you don’t have to put up with it anymore. The structure of family life can be seen in a similar vein. For most of us, a happy marriage is a more appealing prospect than a life alone. But the divorce-recession link appears to indicate that in many cases affluence is an opportunity to escape or avoid unhappy partnerships. Under the circumstances, we should not be surprised that the relatively affluent America of 2012 includes more single people than the poorer America of 1962. One of the most striking facts about the current downturn has been a temporary halt in what demographers call “household formation.” Normally the number of households is lower than the number of people, but both quantities grow at roughly the same pace. Since 2007, however, the net formation of new households has essentially come to a halt. Each new household, in other words, has been offset by the elimination of an existing one thanks to death or doubling-up. The most obvious culprit is young people. 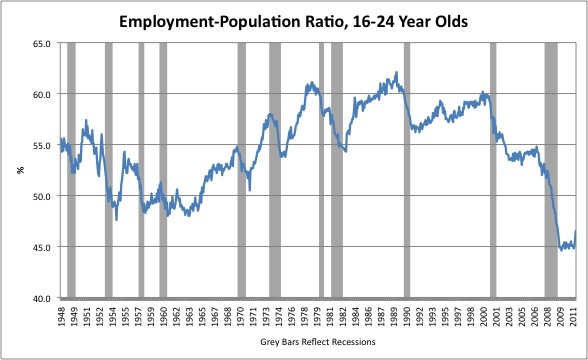 With the youth employment levels at record lows, more and more older teens and twentysomethings are living with their parents. But divorces also create new households, so the falling divorce rate also plays a role. In both cases, an economically suffering America has less opportunity to form new households. At the same time, these trends remind us that despite the painfully slow recovery, future acceleration could come faster than people expect. There are millions of “missing” households in America that can appear—through childbirth, divorce, or moving out—very suddenly if people get a bit more in their pockets. And each new household carries with it not just a home, but a wide array of appliances, furniture, and other durable goods. An income boost, in other words, could create a wave of household formation that drives nationwide incomes even higher. That’s why I, at least, will be rooting for more marriages to fail in 2012.